The ‘controversy’ over a blown call late in regulation time of the NFC Championship Game is starting to make one long for the halcyon days of ‘Deflate-Gate’. First of all, let’s reset the situation for any of you who may have been living in a cave for the past month: the New Orleans Saints are upset because of a pass interference call that should have been made late in the NFC Championship game. Your response will likely be ‘that’s understandable but officiating mistakes are just part of the game’. You’d be right, of course, but that reality of life has apparently not occurred to the New Orleans Saints and their fanbase. For some reason, they feel that a great injustice has taken place and determined to enshrine themselves in the ‘sore loser Hall of Fame’ they’re not going to let it go. ESPN appears to have wanted the Saints in the Super Bowl as well and is cheerfully fanning the flames. And lest you think that the Saints are the latest in a long list of teams that have been on the wrong end of a bad call they’re going to keep reminding us that no team has ever suffered the same way that they have. Saints’ owner Gayle Benson affirmed the gravity of the situation by vowing to ‘aggressively pursue changes in NFL policies to ensure no team and fan base is ever put in a similar position again’. It’s also not apparent what the Saints ecosystem wants to happen now. The game is over. Do they want to be given a Super Bowl berth despite the little detail that they didn’t win the game? Do they want the NFL to send the Los Angeles Rams home and award the Super Bowl to the New England Patriots as punishment? Do they want a ‘do-over’? At any rate, Benson’s comment ranks among the most absurd ever made in sports. The NFL has enough problems—a system of remediation that kicks in whenever a team and/or their fanbase complains about something stridently enough is the last thing they need. Unless NFL football games are to be conducted by a copy of ‘Madden 19’ set on autoplay (can’t have the human element of people representing the teams to play the video game) an error free outcome is simply impossible. Even were this to happen, I guess the Saints could still blame the people that did the coding for the game if they didn’t get their way. For now, NFL Commissioner Roger Goodell is trying to act concerned. He’s called everyone involved with the Saints franchise to talk them off the ledge. He’ll likely have to make a new round of calls in light of a new phony subplot to this phony controversy—the officials were biased against the Saints because they live in Southern California. They called the game straight down the middle until this crucial moment when they all conspired to send the Los Angeles Rams—a team that has been back in town for just a few seasons after a couple of decades in St. Louis—to the Super Bowl. Like most phony controversies, you can thank the geniuses at ESPN for this one. 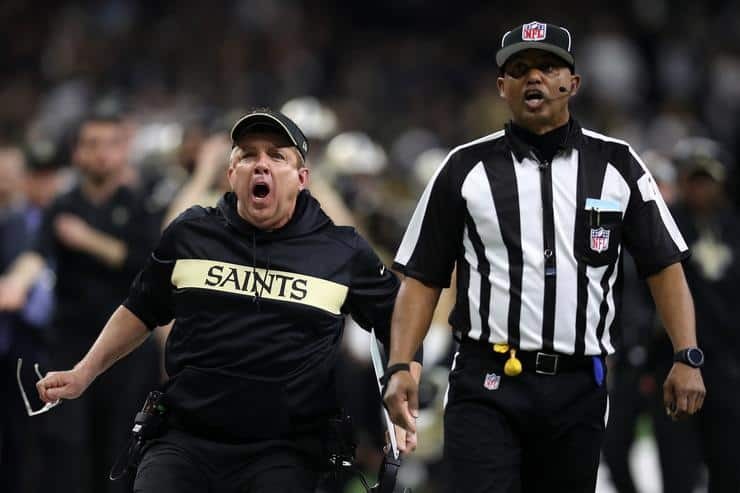 Never mind the fact that officiating crew lead Bill Vinovich was previously a pariah of Los Angeles fans as the team has gone 0-8 in games he’s worked since 2012 and that his crew worked two of the Rams three losses this year to Philadelphia and…uh….New Orleans. The NFL released a statement which is the only sensible sounding statement in this ridiculous soap opera: “Officiating assignments are based on performance and not geographic location.” Assuming that this policy continues, a referee from the Los Angeles Metro Area (population 25 million) or the New York City Metro Area (population 20 million) will continue to be allowed to do his job.